Although many methods have been proposed for engineering service systems and customer solutions, most of these approaches give little consideration to recombinant service innovation. Recombinant innovation refers to reusing and integrating resources that were previously unconnected. In an age of networked products and data, we can expect that many service innovations will be based on adding, dissociating, and associating existing value propositions by accessing internal and external resources instead of designing them from scratch. The purpose of this paper is to identify if current service engineering approaches account for the mechanisms of recombinant innovation and to design a method for recombinant service systems engineering. 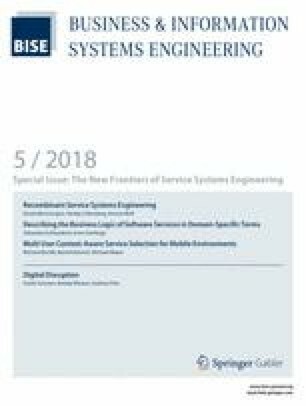 In a conceptual analysis of 24 service engineering methods, the study identified that most methods (1) focus on designing value propositions instead of service systems, (2) view service independent of physical goods, (3) are either linear or iterative instead of agile, and (4) do not sufficiently address the mechanisms of recombinant innovation. The paper discusses how these deficiencies can be remedied and designs a revised service systems engineering approach that reorganizes service engineering processes according to four design principles. The method is demonstrated with the recombinant design of a service system for predictive maintenance of agricultural machines. Accepted after one revision by Prof. Dr. Zdravkovic. The online version of this article ( https://doi.org/10.1007/s12599-018-0526-4) contains supplementary material, which is available to authorized users.